Gordon Ramsay's Entire Staff Takes a Knee, Refuses to Serve NFL Team-Fiction! - Truth or Fiction? Gordon Ramsay's Entire Staff Takes a Knee, Refuses to Serve NFL Team-Fiction! Gordon Ramsay’s Entire Staff Takes a Knee, Refuses to Serve NFL Team-Fiction! 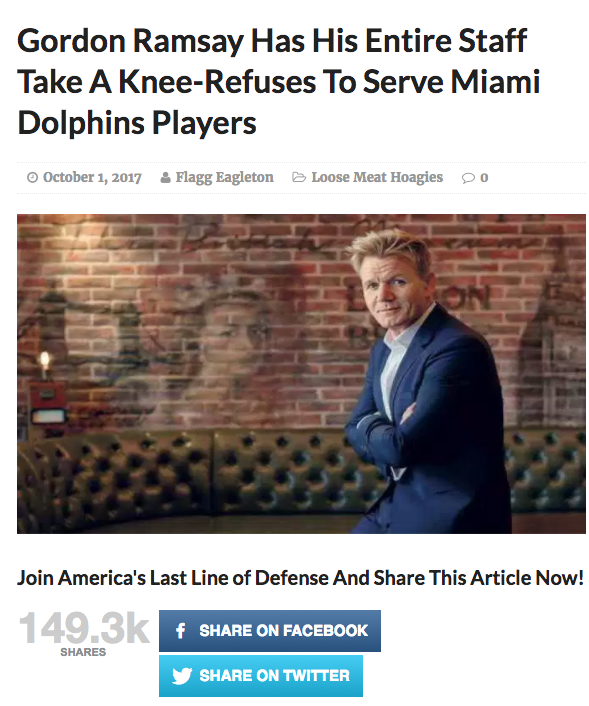 Gordon Ramsay refused to serve members of the Miami Dolphins, instructing his restaurant staff to take a knee, because of NFL player protests during the National Anthem. False reports that Gordon Ramsay refused to serve members of the Miami Dolphins came from a website that admits it presents “fiction as fact” and cites sources that don’t exist. Four Miami Dolphins showed up at Gordon Ramsay’s Soho Social Gastropub for a bite to eat after their horrible performance and disrespect for our flag and our country. Linebackers Malcolm Warner and Clyde Vargus along with right guard Jefferson Michaels and left tackle Mutombo Toki Del Fuego were seated at a corner booth. DISCLAIMER: America’s Last Line of Defense is a satirical publication that may sometimes appear to be telling the truth. We assure you that’s not the case. We present fiction as fact and our sources don’t actually exist. Names that represent actual people and places are purely coincidental and all images should be considered altered and do not in any way depict reality. The claim that Gordon Ramsay had his staff take a knee is just the latest in a long line of rumors about the fallout from NFL National Anthem protests. Others include a false rumor that Budweiser has pulled NFL ads and a true rumor that Checks-into-Cash CEO Allan Jones said his companies would pull support for NFL broadcasts. A website that fabricates stories is behind false reports that Gordon Ramsay had his staff take a knee when NFL players came to his restaurant. Chilling Item Links Las Vegas Shooter Stephen Paddock's Room Links to Barack Obama-Fiction! "Why I left California" Commentary About "The Progressive Destruction of California" -Truth! & Fiction!